Treat yourself to amazing food and tantalizing drinks while being awe-inspired by the most breathtaking views of the majestic Kuala Lumpur skyline. Take your delicious dinner up several notches with these restaurants that combine award-winning food, incredible locations, superb service and views to die for. These superlatives are well deserved, as you will see it for yourself when you decide to dine in the sky. Here are six restaurants that will truly elevate your dining experience. Hailed as a haven for affluent steak-lovers, Marble 8 offers the finest cuts of Wagyu and Angus beef in KL, chosen exclusively by Modesto Marini and flown in from one of the world’s largest beef providers in Australia. Upon arriving in Malaysia, the beef is then dry-aged in their state-of-the-art bespoke ageing cellar for 21 to 40 days, allowing the beef to retain its freshness and incredible flavor. Marble 8 is located on the floor below Marini’s on 57. It’s beautiful interior has gleaming wooden flooring, lovely instrumental music and plush leather sofas. 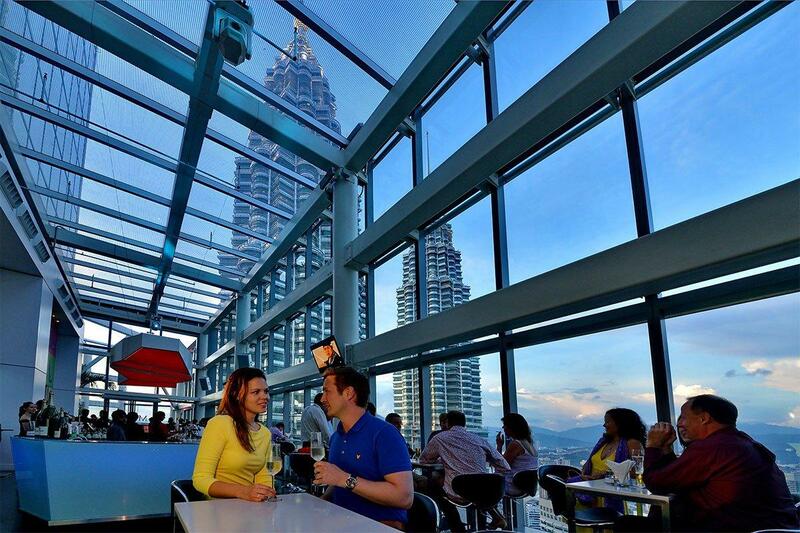 The best way to truly enjoy dining at Marble 8 to reserve a table by the floor-to-ceiling window, where you will be able to appreciate the breathtaking view of the PETRONAS Twin Towers and the city skyline. The pride of this steakhouse in kl also lies within their selection of wet-aged beef, which is vacuum-sealed to retain its natural juices and stored for minimum of 21 days. 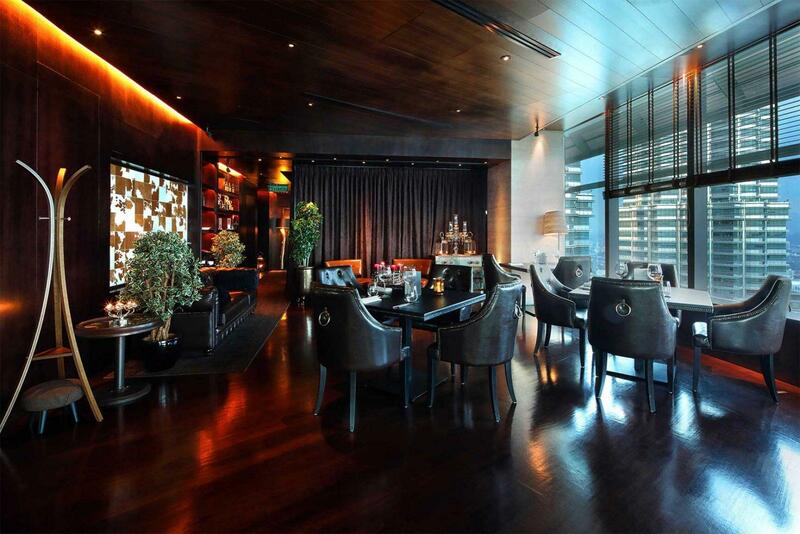 Thirty8 is an amazing award-winning dining room, wine bar and lounge that is nestled on the 38th floor of Kuala Lumpur’s Grand Hyatt Hotel. It’s well worth a visit for both its incredible menu and unbeatable views. 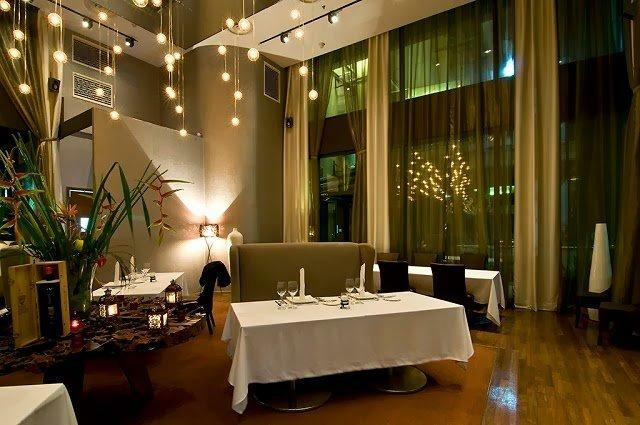 Upscale, stylish and inviting, Thirty8 is fascinatingly polished but unpretentious. The kitchen, led by Executive Chef Tommy Franssila, churns out classic Chinese, Japanese and Western Cuisine including a flawless array of sashimi and sushi, with a focus to tempt both local and international gourmet lovers with their creative flavors. The gorgeous wraparound windows offers a spectacular 360 degree view of the Kuala Lumpur skyline, with the striking PETRONAS Twin Towers a mere kilometer away. 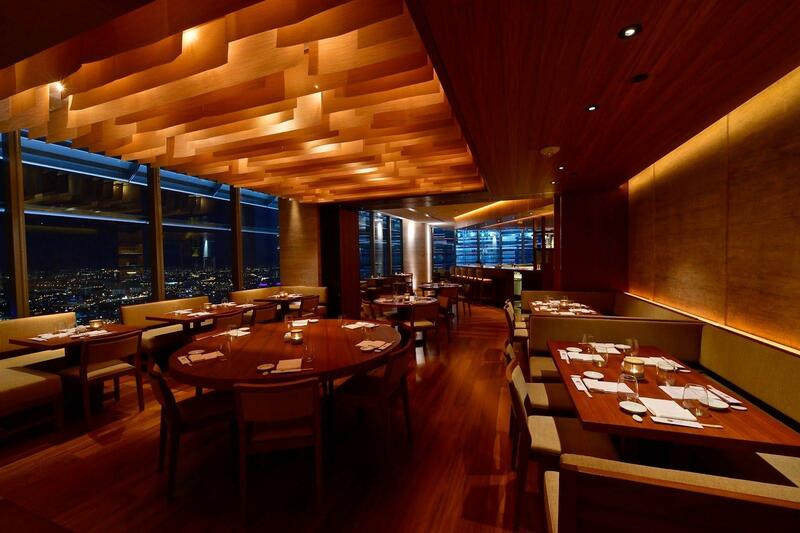 One word that comes to mind when describing this high-rise dining room on the 23rd floor of Troika Sky Dining is impressive. Cantaloupe is a fusion focused, rooftop-esque restaurant that has slanting floor-to-ceiling angled glass windows that offers a weatherproof culinary experience at an altitude. It’s a must see spot for the setting that presents a breathtaking view of the looming spires of the Twin Towers and the rest of Kuala Lumpur. Chef Christian Bauer’s food has impressive line up of haute French, Italian, Greek and Spanish flavored dishes. There is also an Italian bistro just up a discreet spiral stairway called Strato, which is famous for attracting young, trendy urbanites. This beautiful eatery is very welcoming with a chic industrial themed interior, comfy cream loungers, marble-topped tables and wooden floors. Just across the room from Cantaloupe is Claret, a wine bar that offers incredible cocktails. The décor is beautifully understated and elegant. You’ll see classic wooden and steel fixtures mixed with quirky furniture that adds a cozy touch. The best of part of the Claret is the outdoor terrace that has Chesterfield sofas where you relax and sip on a cool gin and tonic while admiring the stunning skyline. 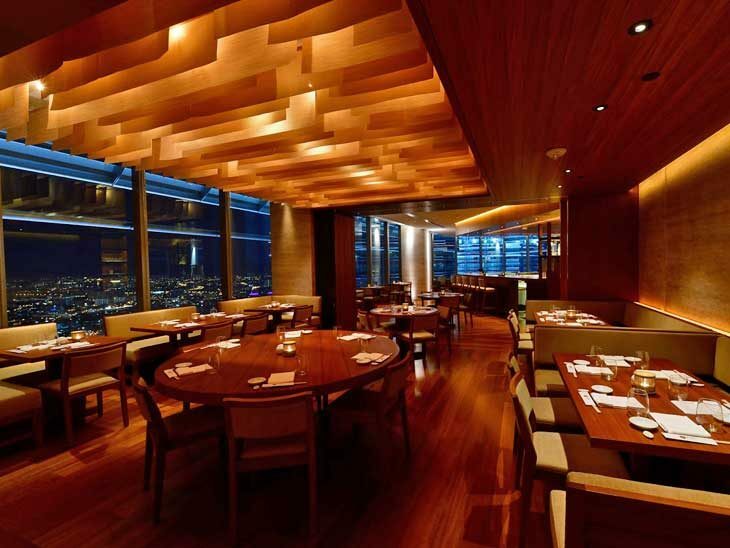 Southeast Asia’s first Nobu restaurant, a Michelin-starred titan in the world of sushi, sashimi and tempura, now boasts another impressive feature, which is the awesome view of the city from its KL counterpart. This world famous restaurant is co-owned by American actor Robert De Niro and was first started in 1994 in New York. It then went on to win critical acclaim for its extraordinary dishes that were creative yet comforting. Chef Nobu Matsuhisa and his partners went on to conquer the culinary world, opening 29 franchises globally. The décor is stylish, with textured blonde wood furnishings and fixtures that allow the food to take center stage, and rightfully so. The cuisine at Nobu is a perfect marriage of Asian simplicity and exotic South American (specifically Peruvian) flavors. You can expect more than 40 cold and hot dishes and all dishes are halal (pork-free). 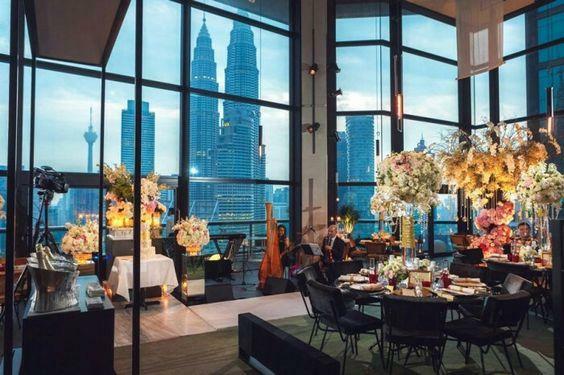 Located on the 29th floor of the G Tower Hotel along Jalan Ampang, this magical restaurant overlooks the beautiful Lake Gardens and the gleaming city skyline. Besides the view, the food will manage to distract you, as the dishes are simply sensational. Savor European dishes that are truly memorable, like the 28-day home aged strip sirloin. 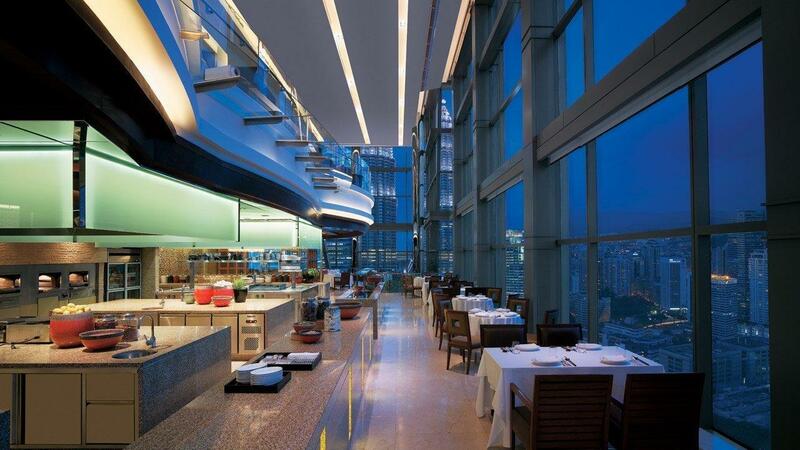 The mirrored ceiling and gorgeous views of the twinkling city center suggests a sense of space and elevation. Cozy up amidst fairy light chandeliers, polished golden wood floors, heavy gold brocades, ceiling-to-floor curtains, plush burnt orange carpeting and burnished gold upholstered furniture. The kitchen’s seasonal menu changes every fortnight so there is always something new to try.